Awareness and gratitude are a chicken and egg situation. Which comes first? Are they one and the same? Being fully aware of the world around you, having knowledge of it, and experiencing it in all it’s subtle shades and endless variety is something that comes gradually as our perception becomes more and more capable of perceiving. For example, a little kid might lump spiders, ants, earthworms, bees, and wasps into one category. It’s a bug. It’s a bug. It’s a bug. Gross! Over time they may perceive how remarkably different each of these creatures are, how their jobs vary, and that there are complex things going on all around us all the time: over, around, and under. We just need eyes to see, and minds that are open to discover. I find that gratitude and awareness are so intertwined and wrapped up in each other that they are difficult to tell apart. Grateful hearts tend to be open to discovery, which leads to greater awareness of the world and universe, which brings further gratitude and joy. Here are some means of cultivating this, in no particular order. Over the next week I’ll be continuing this theme. Grow some of your own food. At the very least, know where it comes from. If possible, develop a relationship with a local farmer. This week a new flock of baby chicks came into our care. All of them are cute, little fluff balls. It’ll be 24 weeks before we receive a single egg from them, but my kids will understand where eggs really come from. It’s a lot of work. Sometimes it’s messy business. However, we will all be tremendously grateful for that first egg that emerges from a chicken’s vent. FYI, that’s the same hole that they defecate from. Perhaps you didn’t know that. They are fascinating creatures. There have been several times when our refrigerator has been bare, and there will be nothing to eat unless there’s an egg or two to add to a recipe. 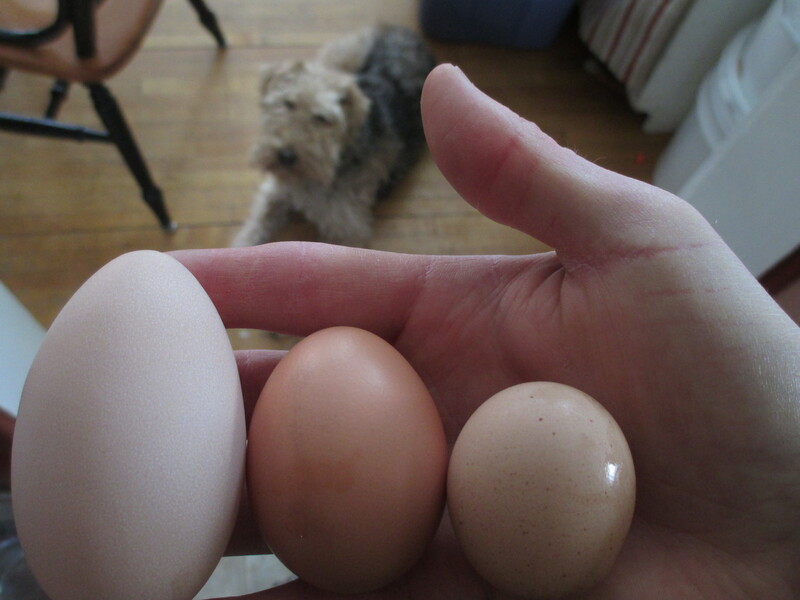 I race out to the chicken coop, expecting nothing, and find an egg still glistening and warm. Occasionally I’m face to face with the business end of a chicken and watch the pressure egg emerge and drop onto the straw. Amazing. This makes you remarkably grateful for breakfast or dinner. Also, eggs shouldn’t look standardized, as if they were produced in a factory. Just saying…..
Several of my friends raise honeybees. They all seem to grow spiritually from the experience. I hope to join them in this satisfying, ancient work some day. Hives of bees are marked by beauty, order, and cooperation. Developing a relationship with them enlivens all five senses. 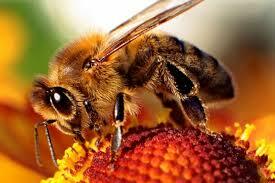 Beekeepers routinely develop great appreciation for the creator by observing these fascinating creatures. Spiritual insight comes to them as unexpected gifts at times when they were merely tending to chores. Moments of enlightenment generally come when they are not sought out. They just happen, but one’s mind and heart must be ready to receive them. Lettuce is easy to grow at this time of year. Perhaps you could start with a cold weather crop like this. It has to be watered regularly, though. Beautiful leaves can easily turn bitter if the soil dries out. You won’t take them for granted after doting on them. This sounds weird, but the act of hanging clothes on the line is tremendously cathartic. I can honestly say that it is spiritually satisfying in a way that is impossible for the dryer to compete with. When I am stressed or feeling rushed I find that 15 minutes spent individually hanging items of clothing balances me out and provides a better sense of perspective. This activity has salvaged many a day that would otherwise find me a surly, unproductive grouch. All five senses are enlivened by the process, which is a common theme here. This one is key, for we are essentially on a journey our entire lives. A common critique of people in my faith tradition, Christianity, is that its adherents are only concerned about Heaven and the afterlife, and are of little earthly good. This one stings. There is truth to the criticism in some quarters. In big picture terms we absolutely must live life to the fullest, finding joy along the way. By doing so, not only will we be happier and more passionate people, we make ourselves more useful to others. Don’t just fixate on the destination. This is why I am a huge proponent of biking and walking to most destinations. During most journeys by car we tend to be obsessed with the end goal (getting to work on time, running errands, etc). There is much to be thankful for along the way, however. 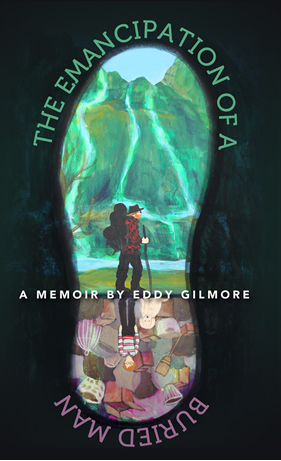 In fact, the journey itself often provides the most fodder for gratitude and awareness. On the bike your eyes and ears are open and alert. You are fully aware of your surroundings, if only for the sake of safety. You cannot help but observe other meaningful things along the way that cause gratitude to bubble up. Walking provides even greater opportunity to make note of blooming flowers, interesting architecture, or for conversation with passersby and neighbors. You miss these, and much more, every time you take the car. This practice also allows for thoughtful observations to percolate through even tiny details that would otherwise go unnoticed. During a recent journey into the heart of our city I observed several boys walking home from middle school. They were alarmingly clean, possessed a Bible-school-casual level of cleanliness, and even their shoes appeared to have never veered off clean pavement or carpet. They were brilliantly new looking even though we are nearing the end of the school year. Since I observed the phenomenon repeatedly, I attribute this to a pattern and not simple coincidence. The experience enabled me to put my own frustration over my elementary-aged kids tracking mud into the house into a better perspective. SNEAKERS SHOULD BE DIRTY! Clean, new-looking shoes, and flawless looking clothes made me wonder if these boys ever do anything outside. This might be a bit judgmental, but shoes shouldn’t be that bright. For the first time, I have become thankful for my kids’ dirty shoes. Weird, huh? I didn’t seek this insight out. Rather, it found me. Be thankful in the journey while being watchful, hopeful, and expectant. Expect to discover something new! This leads to childlike wonder. This sense of wonder need not disappear forever during our teen years. If you’ve lost it, get it back! It may take time, but it’ll come. Read great books for pleasure. Be inspired! Check out my own book if you need help getting started. You will not be the same afterward. This is so much more satisfying than allowing our brains to become hypnotized by the glow of the television night after night. I promise that you will not regret this practice. Try a little at a time, and if you find yourself bored, perhaps you aren’t reading the right kind of book for you. We often become trapped by looking at a large stack of books that we are supposed to read, but really don’t want to. Be your own boss in this area. Donate all those old books you’ve held onto for years that you still haven’t read. Speaking of books, I’m hosting a book launching party for The Emancipation of a Buried Man tomorrow night, May 8th. If you’re in or near Duluth, I’d love to see you at Amity Coffee down on Superior Street in Lakeside any time between 6:30 and 8:30 pm. There’s going to be a fantastic band playing their own original folk, Americana, and blues-inspired numbers. I’ll keep my readings short in the 5 to 10-minute range. I also plan on a lively Q & A time, so please bring your best questions! It’ll be a regular hootenanny with plenty of time to visit and just have fun.